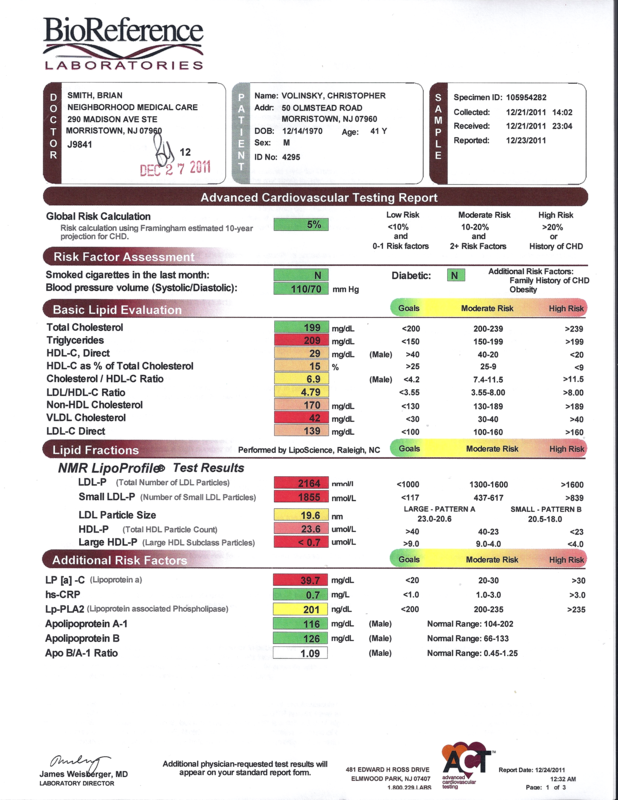 Yesterday I posted about the improvement that I saw in the past 6 months in my cholesterol levels and my bloodwork. So how did I do it? Overall, I basically made a commitment to eat better and exercise more. None of the changes I did were earth-shattering, but a lot of little changes adds up. I heard once that we make 200 decisions a day regarding what foods we eat. I dont have to change all of those decisions, but if I could change a few key ones, hopefully it would help. I did some research. To lower triglycerides, eat lots of fiber, fruits and veggies, and fatty fish (omega-3). For lowering overall cholesterol, go low carb. Fats are tricky: some say to avoid fats altogether, others say fats should be limited but are ok if they are unsaturated, yet others say that you should bulk up on good fats (like olive oil) as much as possible to drive down the caloric % of carbs. How can I know who to believe!?! I am a big fan of Michael Pollan, and his manifesto: “Eat food. Not too much. Mostly plants.” Can’t argue with that one. So in that spirit, I rolled my own plan. It is based on a few rules that I dont follow religiously, but try to keep in mind as I am making my 200 decisions every day…. Try and eat more fish in general, especially fatty fish like salmon. Salad bar every day for lunch at work. I found lunch was the easiest meal to really change my habits and make a difference. I’d often eat a big sandwich or 2 slices of pizza or the burrito special at lunch just cause it looked good. After lunch I would often feel bloated and full and then have a crash around 3pm. Eating a salad, with lots of veggies, some chopped chicken or ham and a little dressing, is yummy, fulfilling, and I generally feel better thru the day. lots of leafy greens on the salad. Spinach, not iceberg. Cut back on snacking: that pre-bedtime cookie snack binge can add hundreds of calories and fat when you need them least. A handful of cashews and dried fruit can suffice if I am really hungering. Less cheese. I used to eat a lot of cheese, and would gravitate towards meals in restaurants smothered in it. No more. Less fried food. Fried food creep is everywhere. Does sushi really need to be deep fried? I usually ask for a side salad to replace fries on my meal — especially since I can steal a few fries from my kids’ plates and dont need a half a plate full of em. I’m kind of making it up as I go along. I have self imposed rules – for instance, I am much more stringent during the work week than on the weekend. I dont fret over what I eat for dinner usually, but focus more on portion size and not taking a second (or third) plateful. Anyway, it has worked for me, and I really dont feel like I am denying myself of very much food pleasure (and I really *do* love to eat!). Of course, this may all be a red herring. My doctor told me when I got my first blood test that no one should ever get their blood tested during the holidays, because we all eat like crap from Thanksgiving until the end of the year. That first blood test was on December 21. He also warned me that even though I had fasted for 12 hours before the test, if I had eaten a cheeseburger as my last meal it would affect the test. That was exactly what I had eaten (how did he know?). For the second test, I fasted for longer and ate really well the day before. So who knows whether the improvement was due to this ‘gaming’ of the test, or really due to my diet/exercise regime? Guess we wont know until the next data point!